Amir Khan: Nefarious Twiddling Or Great British Bitching? 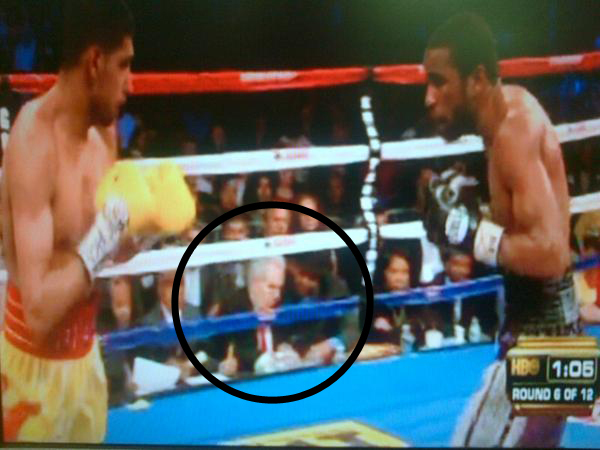 Photo evidence supplied by Amir Khan seems to suggest that an unauthorised individual was lurking in the ringside area during the boxer’s recent defeat to Lamont Peterson in Washington. If it can be proved that the gentleman in question was engaged in nefarious twiddling with judges scorecards, as is being alleged, then Khan should, of course, receive an apology and the opportunity of a rematch at a neutral venue. Unfortunately, bitching and moaning about the circumstances of defeat has become a bit of a habit for British boxers recently. Only six months ago, David Haye was compelled to confess that he would almost certainly have beaten Wladimir Klitschko if he hadn’t broken his pinkie toe in the run-up to the fight. His protestations seemed to fall a bit flat at the time, so in order to fan the flames of public sympathy, he whipped out the digit at a press conference. No one cared. Or there was the time when Manchester’s Ricky Hatton blamed his knockout defeat by the ludicrously talented Manny Pacquiao in 2010 on a “poor training camp” with Floyd Mayweather Sr. Hatton said “I knew it was too soon, and I was just hoping just to get one lucky punch in. That’s not the way you should go into fights.” He has not boxed since. That’s not to say that these aren’t very real issues for the athletes, for whom preparation is everything and neutrality from officials essential. But it’s becoming wearing to hear these guys bitching about the manner of defeat, particularly when they spend the run up to the fight telling the world how much damage they’re going to inflict on their opponent. (Looking at you, Hayemaker). There’s no dignity in excuses and complaints. If you’re going to gripe, at least have the decency to congratulate your opponent on a job well done before you start.